Your hair care products should consist of moisturizing and strengthening ingredients. A hair conditioning plan is greatly recommended for those who desire to grow their hair to bra strap length and beyond. Growing your hair beyond mid back length requires using protein treatments correctly and consistently. Protein is what gives your hair strands extra reinforcement to not snap or break so easily. 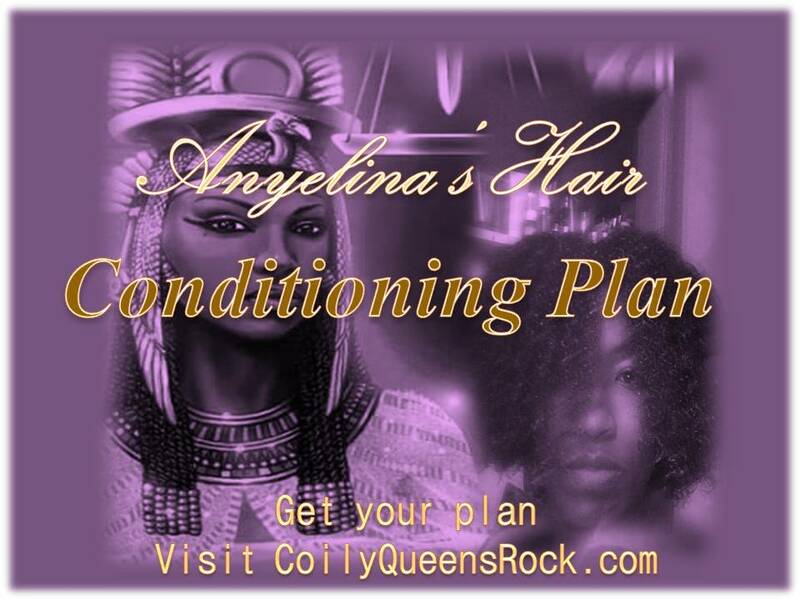 Here are 2 examples of hair conditioning plans for different hair lifestyles. Understand that your hair conditioning plan greatly depends on the current condition of your hair and your hair lifestyle. Her hair stays moisturized for at least 3 or more days. She will need a regular high quality protein treatment once per month. A good moisturizing regimen must be combined with the strong protein. Three reasons why she needs a strong protein treatment. 1. Her hair is long and she wants to retain it. 2. She desires to grow her hair to waist length. 3. She heat straightens her hair. 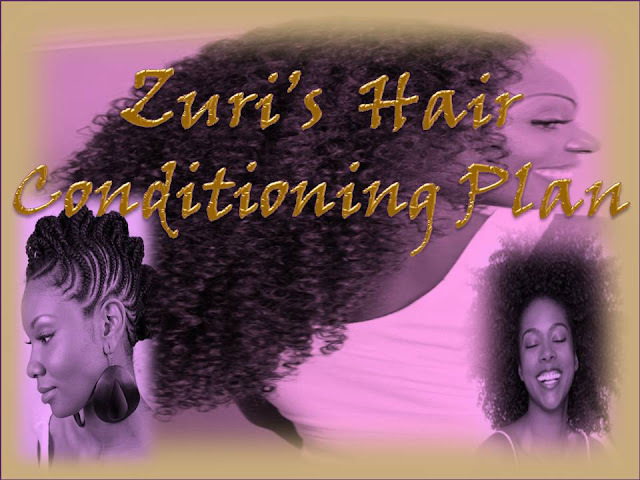 Because a hard protein treatment is recommended, the conditioners Zuri uses are low on protein. She will concentrate on using moisturizing conditioners. The deep conditioner, regular conditioner and leave in conditioners chosen for her are either protein free or low in proteins. She is getting plenty or protein from the aphogee 2 step treatment. The TGIN triple (no protein) moisture conditioner, helps to restore her moisture after she uses the aphogee protein treatment. She will baggy for 3 nights when she uses the aphogee 2 step once per month. The As I am hydration elation is her low protein weekly quick conditioner. She will hot oil treat her hair twice a month. The hot oil is done after deep conditioning. This will help combat her use of harsh heat. She will rotate these products. Aphogee 2 step once per month. The TGIN triple moisture conditioner, once per week. The As I am hydration elation once per week. Leave in daily or as needed. Hot oil treatment every other week and after heat straightening. Wants to grow her hair to its fullest potential. A mild protein treatment is recommended to help keep her hair consistently strong. This will enable her to retain most of her growth each month. She does not heat straighten, so a hard protein treatment is not needed. She will use the protein reconstructor once every two weeks. She conditions once a week with a moisturizing DC then conditions with a protein DC once per week. The Mielle is a good protein conditioner while the hydration elation is a mild protein but deeply moisturizing DC. She is deep conditioning twice a week to keep her very thick hair easy to manage and style. 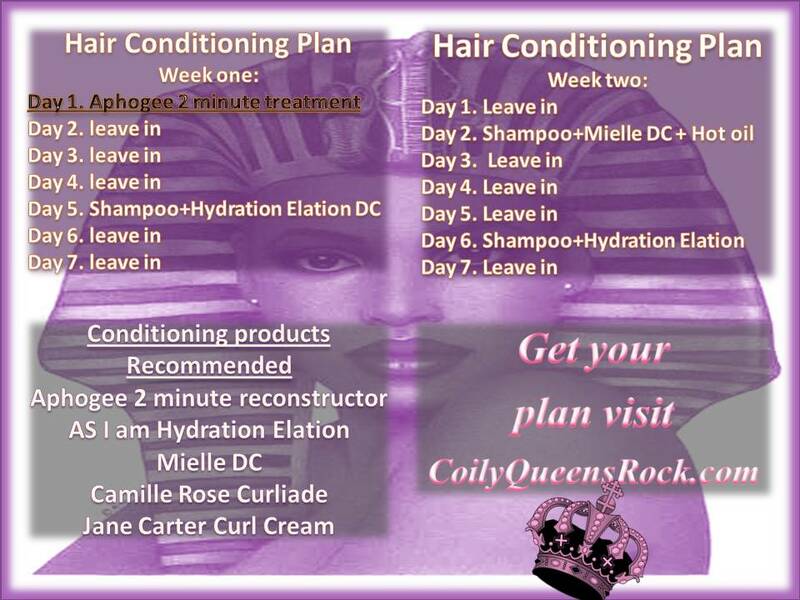 If she continues this conditioning plan along with the CoilyQueens Regimen she will be able to grow and retain hair down her back. Do you have a hair conditioning plan? Get your hair conditioning plan HERE.